Art-C: Blue pottery of Jaipur........... exquisite in its visual appeal!!!!! ART-C is all about an artistic expression of things, whether art, music or books that we most often take for granted. It is also a showcase of my interest & passion in everything handmade, natural, unique & upcycled. Do be a part of this journey with me, and get inspired! Blue pottery of Jaipur........... exquisite in its visual appeal!!!!! Jaipur has always been a must-see tourist place for every traveller whether he's an Indian or someone from abroad, the main attractions being the palaces & monuments. What I'm sure many of us are not aware of, is its local art forms which have existed since ancient times, the most noted of these is the art of making the vivid & exquisite blue pottery!!! This art form, was first developed by Mongol artisans who combined Chinese glazing technology with Persian decorative arts. This technique travelled south to India in the 14th century. During its infancy, it was used to make tiles to decorate mosques, tombs and palaces in Central Asia. Later, the Mughals began using them in India to mimic their structures. Gradually the blue glaze technique grew beyond an architectural accessory to Kashmiri potters. From there, the technique traveled to the plains of Delhi and in the 17th century went to Jaipur. The ruler of Jaipur, Maharaja Ram Singhji under whose patronage this art-form flourished, was partial to blue-glazed ware, and many marble halls in Rambagh Palace have fountains lined with blue tiles. These tiles were also used in the building of the city of Jaipur. 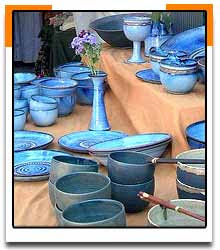 The name Blue pottery comes from the eye-catching Persian blue dye used to color the clay. The material used is quartz stone, for its distinctive properties & peculiar look. It is glazed and low-fired, making the articles very fragile. The blueness of this pottery is got by mixing oxide of cobalt into quartz. The traditional method of painting on the finished surface is not followed here thereby making the pottery all the more unique & distinctive. Other colours like white, Green (Oxide of copper), yellow, dark-blue, brown can also be used. The pottery sometimes looks semi- translucent & its design still reflects its persian/arab roots making use of floral patterns, animal motifs, etc in the works. Apart from the usual urns, jars, pots and vases, one can even find tea sets, cups and saucers, plates and glasses, jugs, ashtrays and napkin rings made in the traditional way & which cater to a more sophisticated clientelle. But no matter the commercialisation of this art-form, the ultimate purpose is to keep it alive & ensure its spread so that it benefits not only the local artisans but also those interested in the art itself!!! 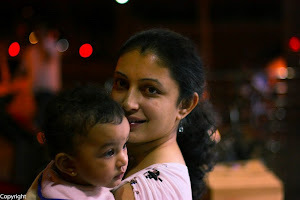 I'm Charmaine, a young Mum, an Artist, a Craftist, a Doctor & a Writer. Art-C is my perspective on Arts & everything that is Creative, whether books, music or art forms. It is also about stuff that I make & paint and things that affect me & which I care about passionately. Art-C. Simple theme. Theme images by gaffera. Powered by Blogger.